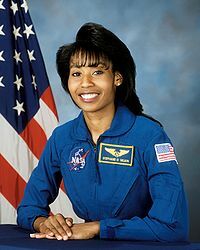 September 27, 1966 Stephanie Diana Wilson, the second African American woman (after Mae Jemison) to go into space, was born in Boston, Massachusetts. Wilson earned her Bachelor of Science degree in Engineering Science from Harvard University in 1988 and her Master of Science degree in Aerospace Engineering from the University of Texas in 1992. 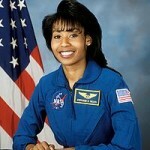 She was selected by the National Aeronautics and Space Administration (NASA) as an astronaut candidate in 1996. After completing two years of training and evaluation, she qualified for flight assignment as a mission specialist. Wilson has flown three shuttle missions, STS-121 (July 4 – 17, 2006), STS 120 (October 23 – November 7, 2007), and STS-131 (April 5 – 20, 2010), and logged over 42 days in space. October 8th in African American History – Jesse Louis Jackson, Sr.